My desk as I left it last night. I've had to start using cheaters for close-up work. Darn it! If I have to use them, they're going to be colorful. Other things you'll see (L-R) bits and pieces from other projects. I'll put them together in the near future. 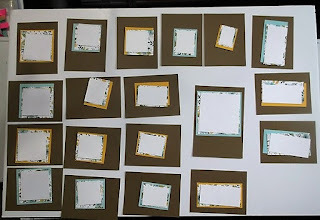 A 12x12 One Sheet project for the SU blog. Towards the back, ink spots being used and stamp cases of ink spots, reinkers and stamps. 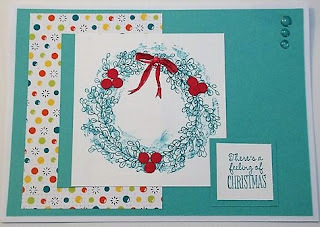 Today, I'm posting the cards I made for the February Artful Stampin' Christmas Challenge. No, I'm not late... for a change. Each new challenge is posted at the end of the month - giving us four weeks to do the challenge and post to the FB group. Last month's post HERE was the January Challenge. 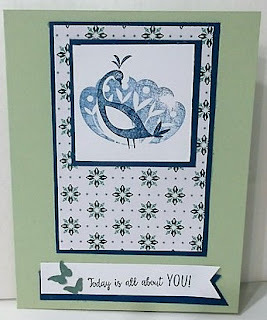 Today I'm showing the February Challenge - because it was issued in February. At some point in the next couple of days, we'll receive the March Challenge - which I'll show you next month. Confused now? LOL I do my best. 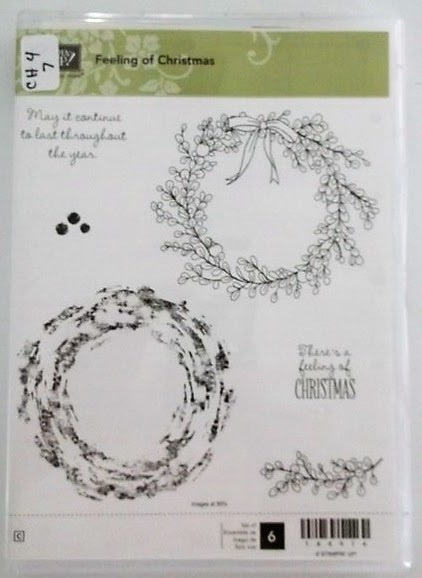 I did a ghost stamping of the wreath background in Bermuda Bay then stamped the detailed image in full ink on top. I colored the wreath in with melon Mambo and added a matching Enamel Dog. The berries are punched from Melon Mambo using a standard hole punch. 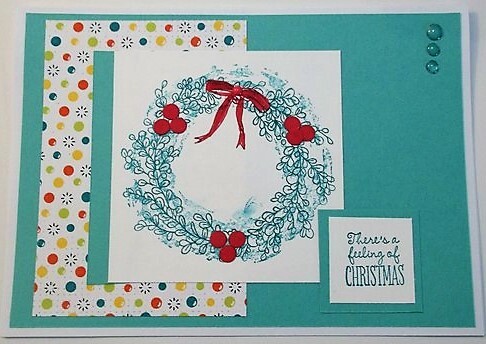 Card Base - 5" x 7"
Card Mat - 6.75" x 4.75"
DSP Mat - 3' x 4.5"
Wreath Mat trim - .75" x 3"
Wreath - 3.5" x 3.5"
Sentiment Mat - 1.5" x 1.5"
Sentiment - 1.25" x 1.25"
Getting the most from my 12x12 sheet of DSP I have four of each color - 8 Christmas cards. I can't wait to see what Ruth has in store for our March Challenge! 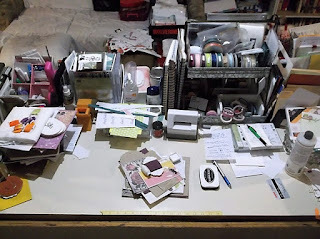 I sat down to work on this post yesterday (Sunday) and for the life of me I could not find that girl stamp I used last month.. you know, the one I wanted to use in every spread. I saw it yesterday morning as I was setting stuff up for a massive card making expedition. Do you think I could find the stamp last night as I began assembling materials? I get really frustrated when I KNOW I just saw something then said item seems to have vanished when I need it. So, this morning I chose to do the layout anyway.. with a different stamp. 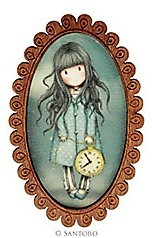 I picked these adorable SANTORO stamps up in a scrapbook store in Branson a couple of years ago. I bought several plus gifted the PBR girls each with one. Aside from having limited selection this week I chose The White Rabbit because I seem to always be at the tail-end of whatever's current. All the way back to grade school. Dad always conceded to letting me where the latest clothing style as it was fading. Leaving me embarrassed rather than enjoying being part of my peers. As I embark on the mixed media, art journal, planner craze I can't help but feel I'm lagging behind the pack and by the time I'm full in - something new will be the craze. But the cool thing about art - Art never goes out of style. Mediums change, but the concept of CREATING something from nothing, EXPRESSING our intentions, BARING our souls on paper in some form will always be a part of our journey. I've used Recollections watercolor-filled brushes, The Paper Studio Bubblebilities stickers and perma markers to create the journey as well as the fork in the road. Every day I have to choose to do the 'real life' stuff or play in my studio. 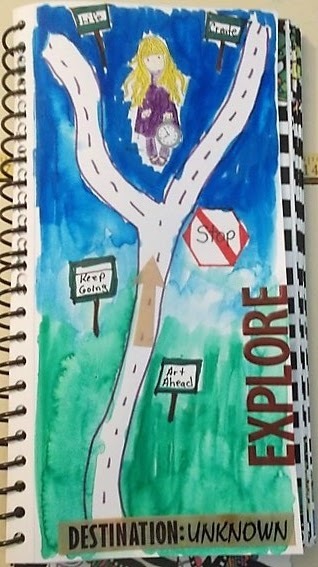 And... there I am at the fork in the road, debating if I can find time for both. My life is CRAZY but I am BRAVE and STRONG! 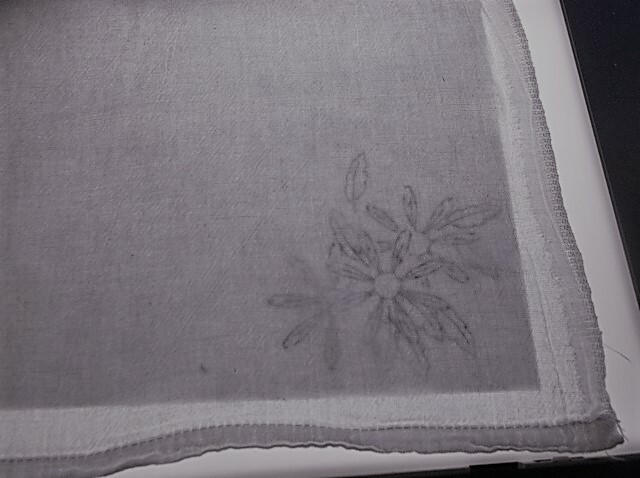 Last week, I stamped the Daisies onto paper then used the light box to transfer them to the dish towel with a graphite pencil. I thought I'd try a different technique this week. I am using You're Inspiring from the Spring Occasions Catalog. In place of the Daffodil Delight marker, I used the Crushed Curry I did have. The stamped color won't make any difference. Since Stampin' Write markers and inks are water soluble, I decided to stamp directly to the towel this time. If it all washes out, fabulous. If not, if I pay attention to what I'm doing then the lights should be covered anyway. I did run into a snag last week so I don't have progress on the daisy dish towel. I can't find a single embroidery hoop in this house! Well, that's not true. I've not checked the tub in the old sewing room downstairs - the room where tubs of fabric are stored. I'm going to look down there today. If not, then I'll pick one up while I'm out shopping this weekend. I'd really love to have these done before Easter! 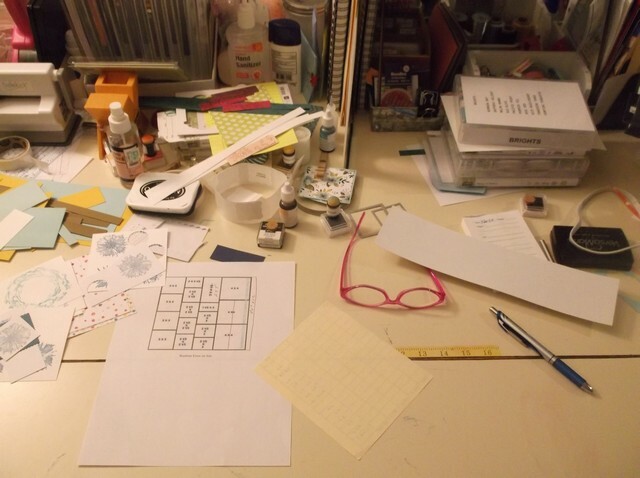 There is the main work area of my desk. Not as bad as last week. 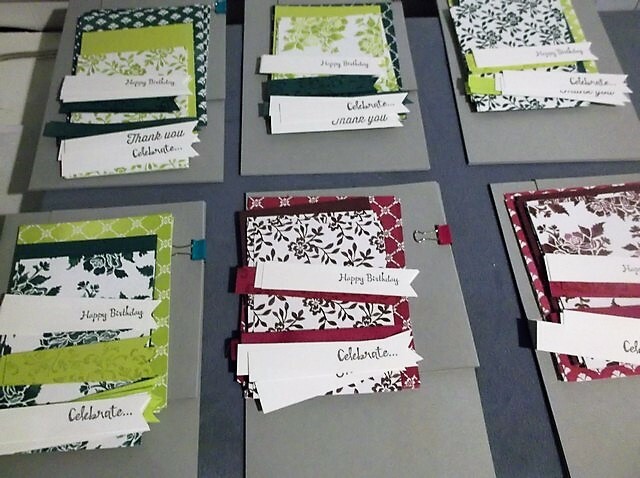 I had to clear a space yesterday and pull up the leaf to work on a batch of cards. I'd seen a VIDEO by Dena Rekow for doing simple cards with Designer Series Paper as the focal point. 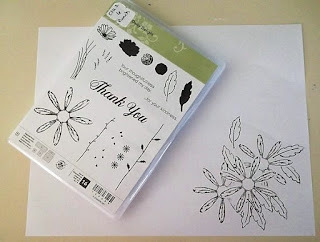 I have 4 packs of Fresh Florals and knew this was the perfect project for some of that paper. I'm not sure how everything came about but once I started cutting, I decided I'd make six of each floral pattern. I chose Smokey Slate cardstock for my card base and for the mats on the Powder Pink. When I have them all together and ready for the blog on Saturday, for Keep It Simple Saturday, I will have 40 cards! 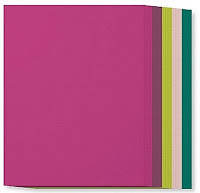 3 Happy Birthday, 2 Celebrate and 2 Thank You in each color combination. This week is all about the card chicks. I think that's what I'm going to plan for the 3rd Tuesday of every month. 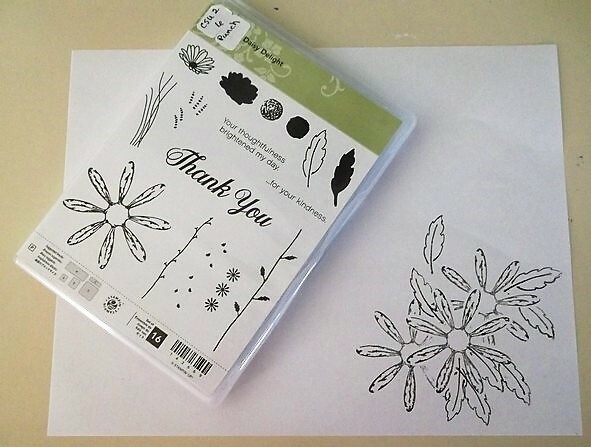 We post our cards from the kit to the thread on Splitcoast Stampers around the 21st of each month. Kits are mailed out to reach us around the 3rd of the month. That gives us over two full weeks to play with the contents. Of course, I'm a 'last minute' kind of gal so I was working on these yesterday and this morning. This is the last envelope we will receive from Paula. She's having to take some personal time so has dropped from the group for now. I hope she's able to return in the future. 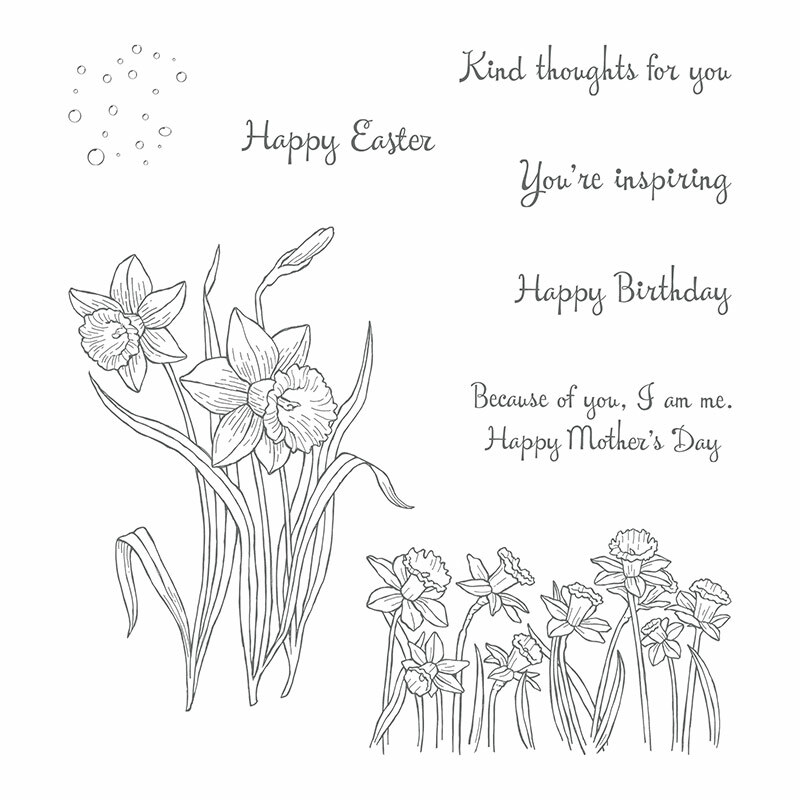 The image is from a stamp set from Sparkle and Sprinkle. They are kind of local to me here in Florida and used to have a brick and mortar store, but now they only do expos. The ribbon is from SU Daffodil Delight. Paper is from a value pad from Michaels. The butterflies and thank you die cuts I have and hardly ever use. The bling is from my stash. 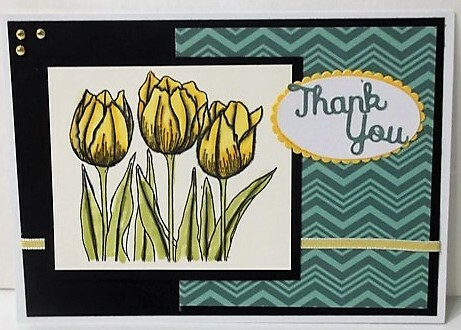 Tulips are stamped on Neena Cardstock with Ranger Archival so you should be able to use just about any color medium on them. 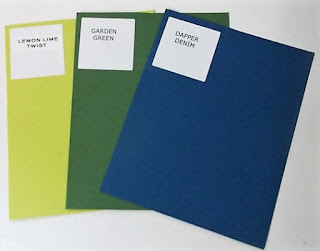 I gave you 2, so fussy cut them, pop them up or just make 2 cards! 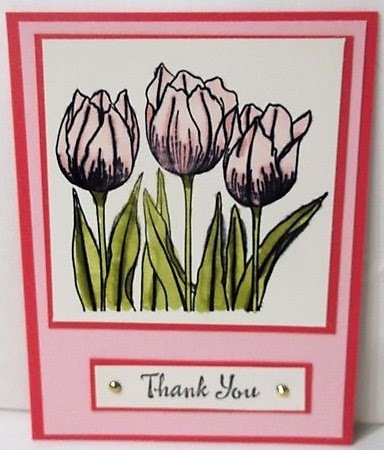 The first 2 cards incorporate the tulip images. I used Stampin' Blends - one in the Daffodil Delight and the other in Pink Pirouette. Leaves are done in Old Olive. This first one is a A5 card. I incorporated the bling, the ribbon and one of the papers she sent. The ovals were cut from the SU Nesting Ovals. Now that I've figured out how they mat, I'm loving working with them! Then I made use of the other piece of DSP and created two additional A4 cards. 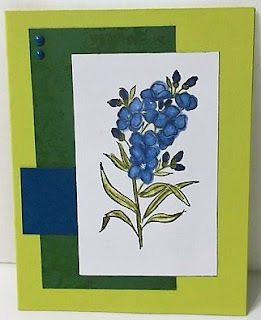 This first one uses a Dapper Denim card base and Pistachio Pudding mats. I chose SU's Beautiful Peacock. The feathers are a second generation stamp. Even though these are clear stamps, they are still hare to position the body perfectly within the opening in the feathers - at least for me. For the second card, I flipped the base colors around. Dapper Denim on a Pistashio Pudding base. That's our cards for this month. 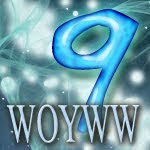 I am excited to see what our April hostess has in store! Since this the month for all things Irish, I thought we'd play in the green tones. The picture above is of Water Lettuce. 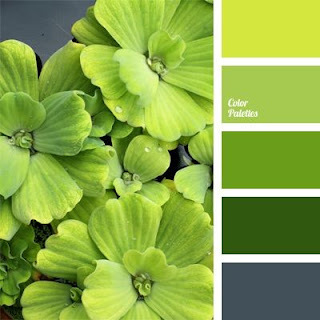 This is an excellent coverage plant for ponds as they help prevent sunlight from creating algae and provide shade as well as cooler water for the fish below the surface. 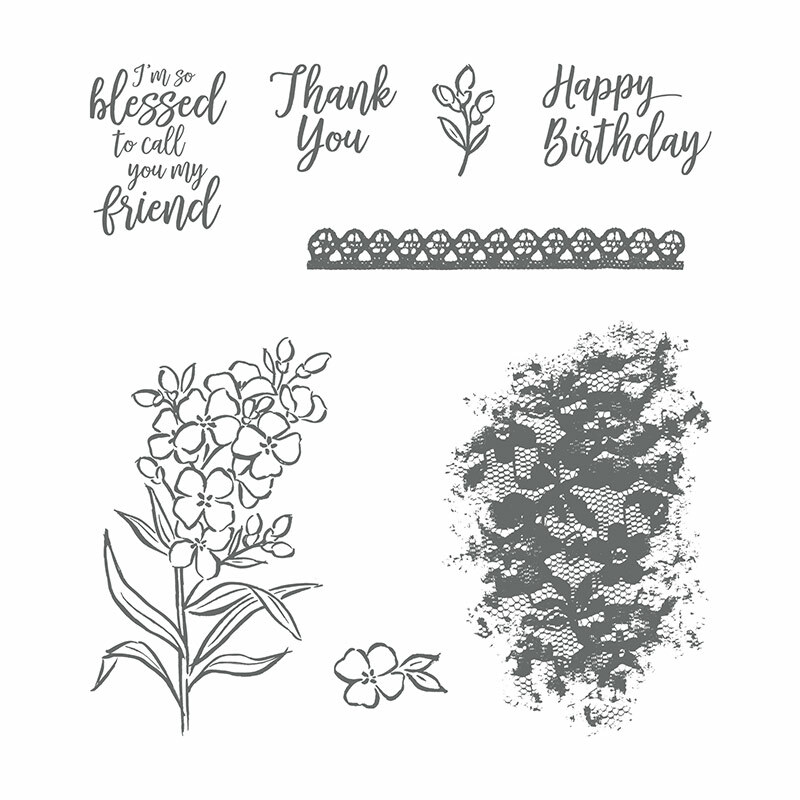 I've chosen Southern Serenade from the Stampin' Up! Spring Catalog again but this time I'll be using three of the stamps from the set. I'm not linking up with other challenges this time around. I just have not had time to scope others out. I've been focusing on getting a manuscript whipped into shape so I can have it up in time for a good Christmas read selection. I went through my Pinterest board, Sketch It! 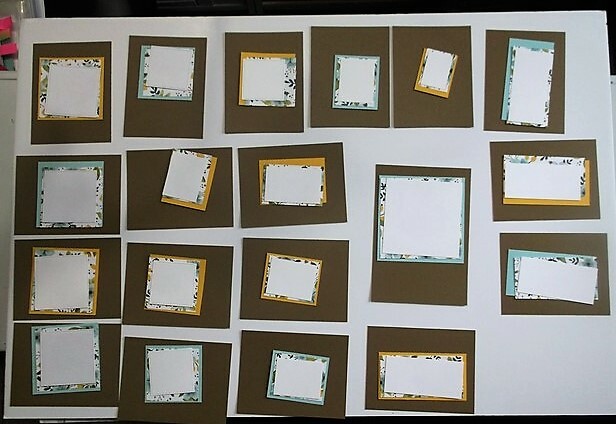 and copied all of them to an Avery Print template. All I have to do now is cut them down to a smaller size. I haven't decided if I'm going to key ring the or put them in page protectors. Binders are so hard for me. 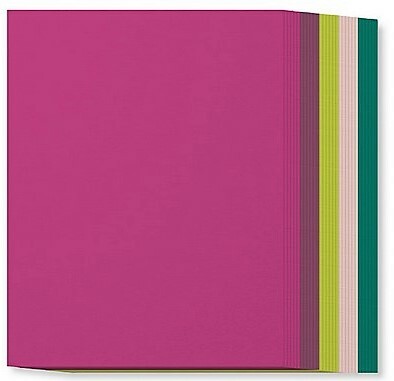 As you'll see from my card below, I followed the Paper Play Sketches in the top left corner of this sheet. I used a Lemon Lime Twist card base. 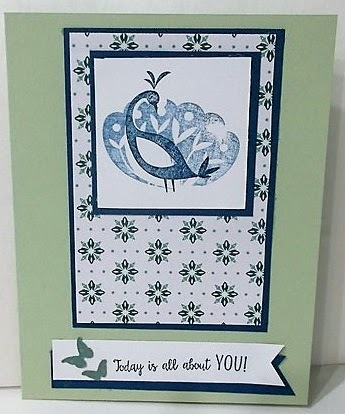 I used the lace stamp from the set to stamp a background in Lemon Lime Twist on Garden Green. 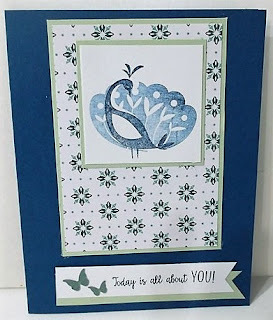 For the horizontal piece I used a strip of Dapper Denim, tying in to the Dappen Denim Stampin' Blends that I used on the image. 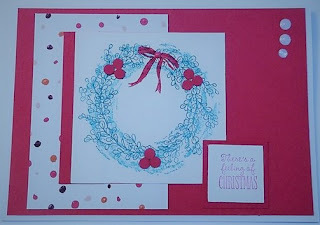 For the embellishments in the top left, I used a large and small Dapper Denim enamel dot. 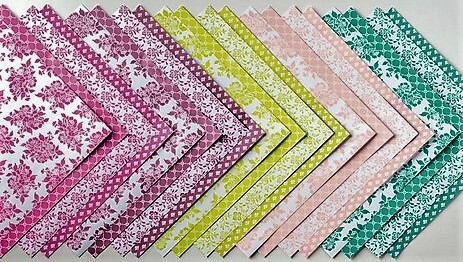 Labels: Color Challenge, March, Southern Serenade, Stampin' Up! Thank you for your patience. I'm running on about four hours sleep and I have a full day. Last fall I talked about wanting to do dish towels for Halloween. I still do and the towels/ embroidery thread are still paired up for that project. But I'm in serious SPRING mode around here. 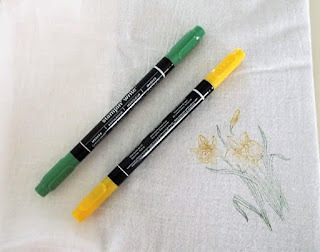 The dish towels I embroidered for a county fair entry twelve-plus years ago are seeing the last of their days so I decided with fresh spring kitchen towels/ dish rags I'd get at least a couple of dish towels up. 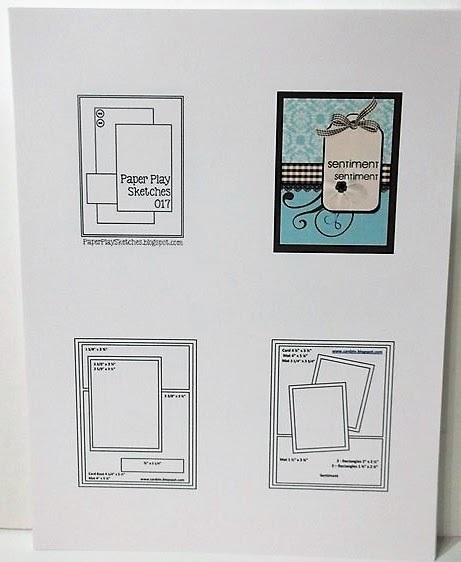 The designs I chose are from Stampin' Up! sets - Daisy Delight and You're Inspiring. 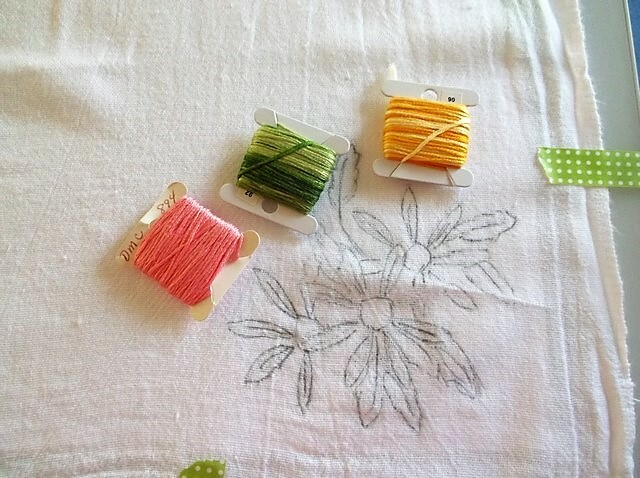 Since I can only embroidery one towel at a time, I'm going with Daisy Delight this week. I'm also going to use two different forms of transfer. This week is all about the light box and a graphite pencil. 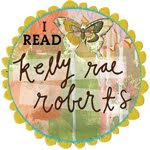 I had a masked image of the daisy (stamped on cardstock then punched out with the Daisy punch) to do the overlay. I stamped the main full daisy, then masked it off while I stamped other daisy's and the leaves to make them appear as if they were in the background. Everything was done in Memento Tuxedo Black ink. I sketched it out with the graphite pencil on a corner of the flour sack towel. 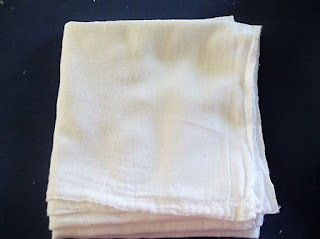 I have to tell you, the ones from walmart are not the good towels. 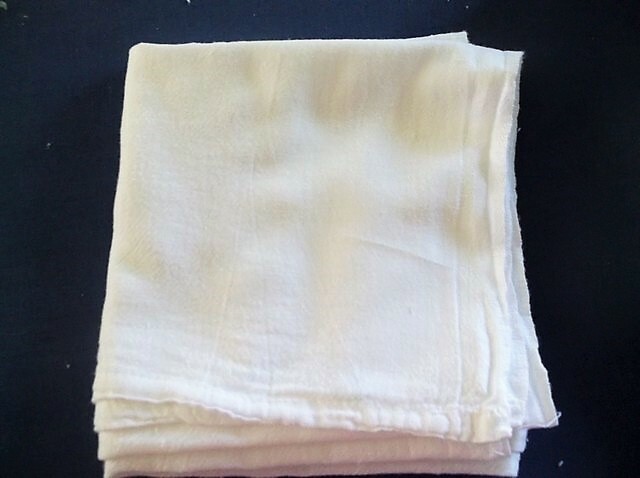 These are thread bare. I'll be lucky to get two years out of these. Gives me time to find better quality? 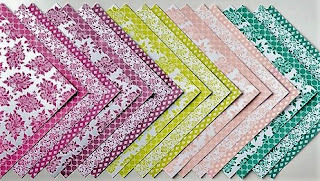 Maybe something on the Spring Quilt Shop Hop next month. 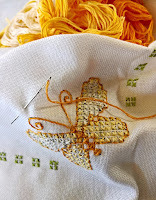 And here's the final product - ready for stitching. 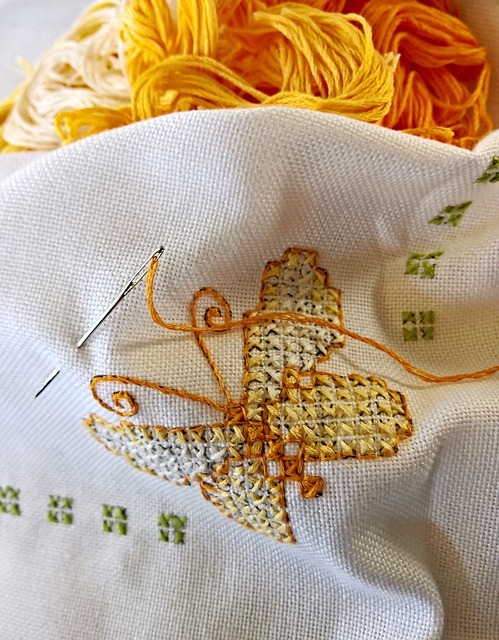 I'm thinking I'm going to have to start taking needlework away from the house one day a week to keep it free from pet hair while I'm working.. either that or turn my office into a no-critter zone. But I don't see that happening any time soon. I decided to do the daisies in pink to give them a pop of color. White would just be to bland against the white background. 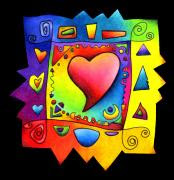 Now if I were doing these on blue dish towels... hmmmm now I'm thinking. Next Thursday I'll show the other design - Daffodils and how I plan to stamp them directly to the towel. I think it will work. We shall see! 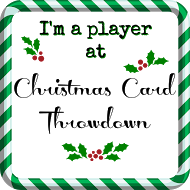 Okay, so I'm a few weeks late into 2018 to play but here we go. I've missed my WOYWW buds. 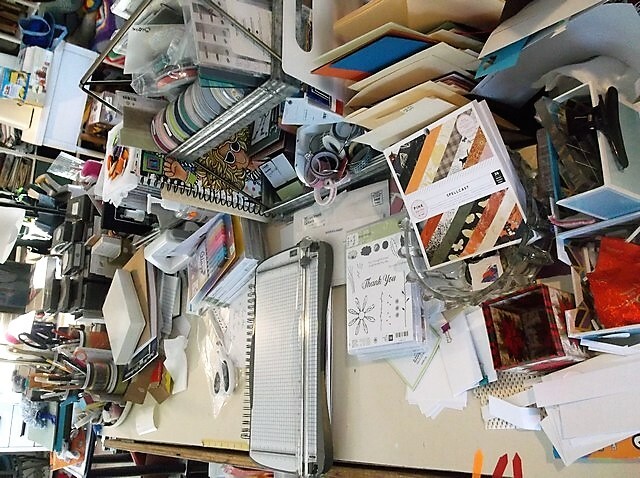 This week is all about the desk... the disaster you guys seldom get to see. Probably because I've not stamped in a couple of weeks. P.S. I'd forgotten about the planner hop I'd talked about last fall. My year just kind of fell apart and I'm just now getting back into the swing of things. I still think it would be an awesome project so stay tuned.